Scorpions are nasty arthropods from the Arachnid class, which makes the close relatives to spiders, ticks, and fleas. Unlike all those, however, scorpions tend to be large and have a menacing-looking tail with a poisonous sting on its end. Most scorpions are not big enough or dangerous enough to be dangerous to humans and are in fact considered to have a positive effect on our environment as they hunt and kill other, more unwanted insects. However, there are quite a few scorpion species that are dangerous enough to humans and pets, especially if you have babies or toddlers in your home. With that in mind, sometimes, the use of scorpion killers and insecticides is simply necessary. There is quite a lot of controversy surrounding scorpion insecticides. A lot of people believe in the myth that scorpion insecticides are ineffective and that scorpions are just impervious to all types of poisonous chemicals. This, of course, is not true. The myth stems from the fact that a lot of wide-range insecticides prioritize other insects such as ants, cockroaches, ticks and fleas, and others, which renders them less effective against scorpions. It’s not rare for customers to purchase such wide-range products for use against scorpions, simply because the label still mentions these arthropods as well. When used against scorpions, however, most such products are simply less effective than one would have hoped and can even leave larger scorpions standing after soaking them with the product. That’s why, if you have a scorpion product, the best thing to do is purchase a specialized product. The products you should be looking for include chemicals such as cyfluthrin, bifenthrin, permethrin and tralomethrin. They will still mention that they work on other types of insects, and that’s fine, but these are the chemicals that target scorpions specifically and can kill them both on contact, as well as through their residual effect. 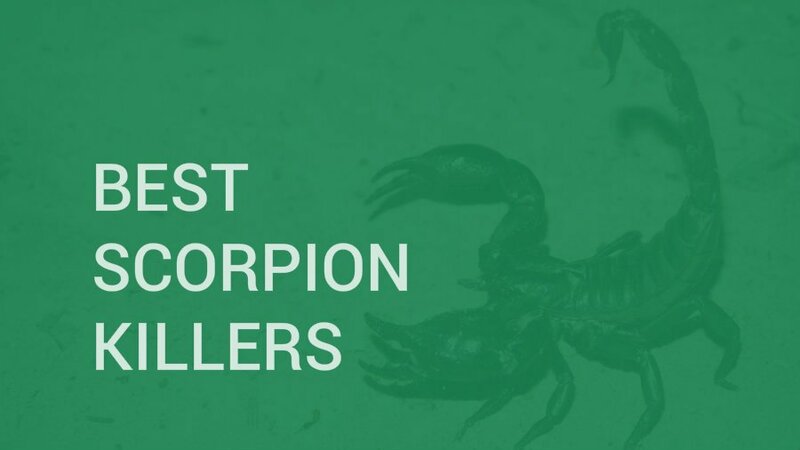 So, if you have a serious scorpion problem and you need to protect your home as best as you can, below we’ve listed several of the products you might want to check out first. We have divided them in a Top 3 and a Top 8 for further convenience and simplicity. Also, after the products we recommend, we’ve also compiled a quick guide on how best to choose and use scorpion killer insecticides, as well as what else you can do to further prevent these Arachnids from breaking into your home. We are starting our “Best scorpion killer” list with this Cy-Kick Scorpions Pest Control Insecticide. This scorpion insecticide comes in a 16 oz. pint and is ideal for the mass extermination of all kinds of scorpions, earwigs, spiders, centipedes and a lot more insect pests. This scorpion pesticide’s active ingredient is Cyfluthrin 6.0%, which is where its name also comes from. The Cy-Kick CS is usable both indoors and outdoors, depending on how and where you want to combat the pests. Still, you must remember to be careful when using it indoors – the Cy-Kick scorpion killer is highly toxic and skin contact needs to be avoided at all times. This can be even more complicated if you have pets or small kids at home. Once the product has dried off, direct contact is not a problem, but be careful when applying it. Also, keep in mind that since this scorpion insecticide needs to be diluted before application, it’s actually enough for a lot of application, which is probably too much for smaller apartments without yard space. Additionally, because of its high concentration, you can mix it down into different mix rates. 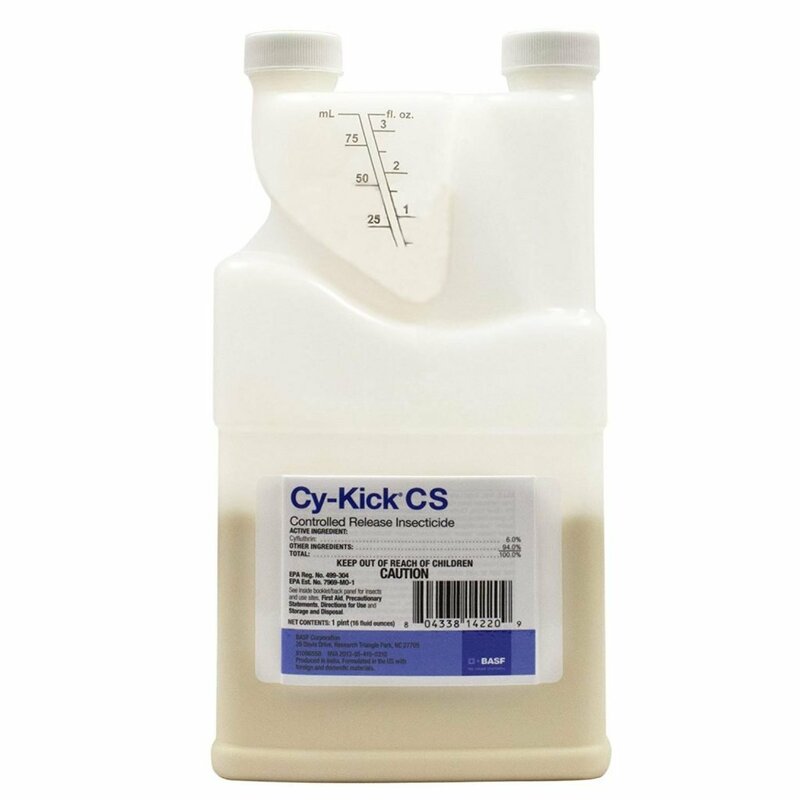 For a 0.5% mix rate solution you can just dilute the Cy-Kick CS Insecticide at a rate of 1 ounce per gallon of water. For a 0.1% solution, you can dilute Cy-Kick CS Insecticide at a rate of 2 ounces per gallon of water instead. What also makes the Cy-Kick scorpions killer one of the best scorpion pesticide products on the market is its residual effect of up to 90 days. For indoors use, finding the best scorpion killer spray is always a great thing, so how about we start with this Terro scorpion killer spray? Thought of as the best spray for scorpions by many, this Terro product kills on contact all types of scorpions, as well as a lot of spiders, ants, crickets, cockroaches, silverfish, ticks, fleas, centipedes, and other insect pests. As any good scorpion spray, the Terro scorpion spray also has a residual effect of up to 6 weeks when applied adequately and isn’t cleaned afterward, which is great when sprayed in the right locations. Another thing that makes this one of the best scorpion killer spray products on the market is its versatile nozzle. It is a 2-way precision nozzle that can be applied both as a wide spray and into narrow cracks and crevices, depending on the situation. The Terro scorpion bug spray can be used both indoors and outdoors, but for maximum effectiveness look at its indoors performance. Particularly in harsh outdoor conditions, you cannot expect to see the spray’s long-lasting effects, although it should still kill everything on direct contact. When you can’t hit the insects directly, apply this scorpion spray in locations such as below and behind sinks, cabinets, and along baseboards and floors, to have the highest chance of hitting the nasty insects, as well as poison their most frequented trails. Coming to us from MGK, this is Onslaught’s FastCap Spider and Scorpion Insecticide. It utilizes a mixture of several insecticides such as Esfenvalerate 6.40%, Prallethrin 1.60%, and Piperonyl butoxide 8.00%. Despite that, this insecticides is great for use both indoors and outdoors, including in and around food and non-food areas. Simply put, you can use it in residential homes, in schools, office buildings, warehouses, storage facilities, theatres, hotels, motels, kennels, industrial facilities, livestock housing, food service establishments such as restaurants, food processing plants, grocery stores, and supermarkets. You can also use it on your lawn, on trees and ornamental landscaping, as well as in various recreational areas, parks, and sports fields. This product works wonderfully on both spiders and scorpions, as well as a wide range of other insect pests such as cockroaches, ants, centipedes, ticks and fleas, and others. 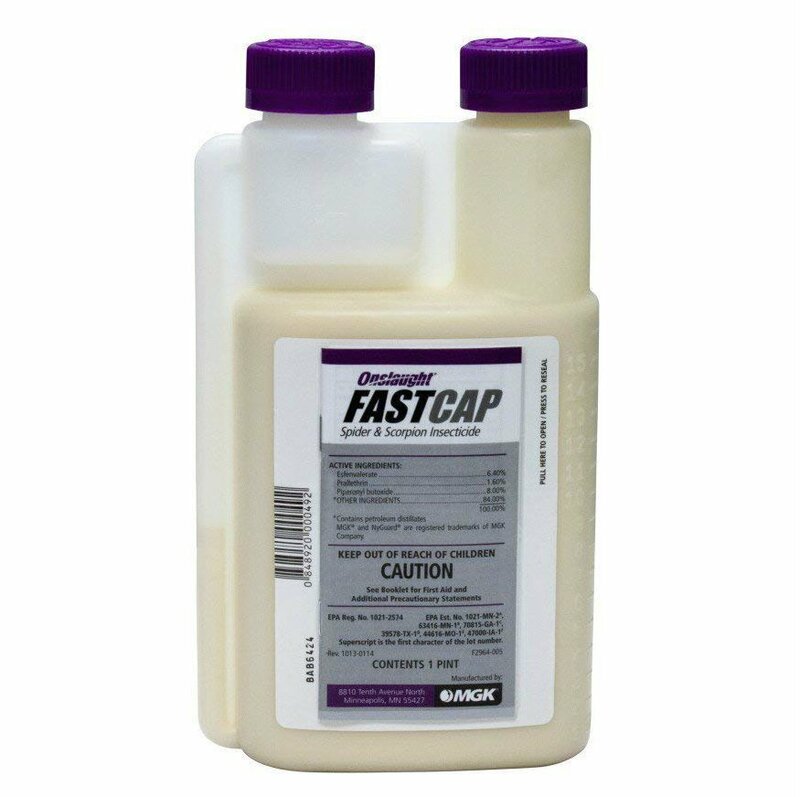 The Onslaught FastCap insecticide has a practical controlled release technology implemented in the bottle for easier application. This insecticide is a residual spray and has a long-lasting residual effect when applied adequately but it rarely kills on contact. If the directions on the label are followed to the letter, in its dry form the product is safe for households with pets and small children, but you should avoid direct contact at all costs. The MGK’s Onslaught FastCap Spider and Scorpion insecticide have a long shelf life of 5 years, which gives even smaller households enough time to properly use all of it, but it is still generally considered to be a product for homes with yards and sufficient outdoor space to warrant its large quantity. After a while of not using the product, the liquid inside is bound to start separating, but that doesn’t mean that it has expired – just shake it and use it again whenever you want. Demand’s CS Insecticide comes in an 8 oz. bottle and it offers up to 90 days of residual effect when applied correctly. It works on over 30 different pest species such as scorpions, ants, cockroaches, ticks and fleas, mosquitoes, and others. What kept it outside of our Top 3 is that it often needs multiple applications to have a noticeable effect, which can put off a lot of customers. Bayer also makes our secondary list with their Bayer Suspend SC Insecticide. This product can be mixed in a ratio of one pint per 64 gallons of water, meaning that it is great for large properties and for extensive applications. It can be used both indoors and outdoors, including in or around food processing facilities. It leaves no odor or residue and it is effective against over 50 types of nuisance pests such as scorpions, spiders, cockroaches, and others. It does seem to be less effective against ants and several other common insect types, however, and it is quite expensive compared to other similar products. Of course, Raid makes an appearance on our list as well, this time with their Raid Max Max Scorpion Killer Spray. This is a kill-on-contact spray that works well against over 30 types of the common household scorpions and spiders. It can be used directly both indoors and outdoors but is more effective indoors. It is also effective against cockroaches and ants, and it contains no CFC whatsoever. What made us exclude this Raid product from the Top 3 is that it doesn’t seem to be as powerful as the Raid on-kill wasps spray. Hot Shot are also here with their Hot Shot Scorpion Killer Spray. It comes in an 11 oz. aerosol bottle. It kills most types of common household spiders and scorpions and contact thanks to its active ingredients of Prallethrin and Lambda-Cyhalothrin, and has a lasting effect of up to 16 weeks. It leaves no wet residue or stains behind it and is great for indoor use against individual insects. The nozzle of this spray is a definitive con as it sprays in a wide arc only and is not good for spraying inside narrow cracks and crevices. Harris rounds up our Top 8 with their Harris Scorpion Killer Spray. It comes in a large 1-gallon tube and with a sprayer add-on for the more precise application. Its odor-less formula is EPA approved and can be used both indoors and outdoors with an equivalent effectiveness. This product is most effective against scorpions but also works well against spiders, most household cockroaches, centipedes, ants, and other common insect pests. What tends to disappoint a lot of consumers is that while the trigger sprayer is a great feature, it’s not of a good enough quality. It’s easy to talk about scorpion killer insecticides as if they are standard insecticides, but that isn’t the case. Scorpions are incredibly sturdy and lively Arachnids that can take on a lot of chemicals before they fall. That’s because they are not only typically bigger than other insects but also tend to have a stronger outer shell and higher resistance to poisonous chemicals. That’s why a lot of insecticides designed for other insects such as crickets, cockroaches, ants, ticks or fleas, tend to be less effective against scorpions. This is where the myth that scorpions are impervious to insecticides comes from. However, as we mentioned above, it’s simply not true. There are some insecticides that specialize in killing scorpions that contain chemicals such as cyfluthrin, bifenthrin, permethrin, and tralomethrin that are highly effective against scorpions. They do have a residual impact on other insects as well, but their primary focus is scorpions. Depending on the exact contents of each product, as well as on the ratio in which they are mixed, different insecticides can be more or less toxic. This doesn’t necessarily make them “better” or “worse”, but instead divides them into ones that are designed for residential areas, food processing installations and facilities, as well as direct application, and others that are meant to have a strong residual effect for several months. Properly choosing and applying the insecticide is key for its effectiveness, as are all the other measures you can take. Insecticides are generally considered by professionals to be the best way to deal with scorpions, but there are other measures that people take as well, particularly when they are under the belief that insecticides don’t work. Scorpion repellents and scorpion traps are the main alternatives to using insecticides, and they do have their uses. If you are adamant that you don’t want to use an insecticide in your home – which is understandable – these would be your primary options. However, both of them are less effective against mass-scale scorpion infestations, so like it or not, you may sometimes be forced to use an insecticide. Or, simply call an exterminator so that they can use one for you. First and foremost you need to make sure that whatever you’re buying is intended for scorpions specifically and isn’t meant as a general, wide-range insecticide. 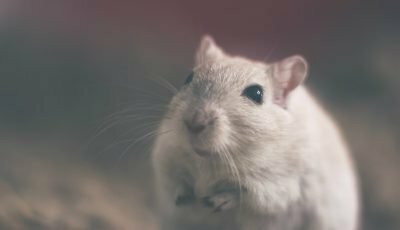 Most insecticides on the market are more focused on cockroaches, ticks, and fleas since these are the insects that plague most households. However, the same chemicals that are effective against those insects, are less effective against scorpions. If these insecticides are of a high enough quality and if they are applied thoroughly enough, they can still kill a scorpion shortly after contact or have a prolonged residual effect, but they are still not what you should be looking at. The insecticides that are intended for use against scorpions first and foremost (and have a secondary effect on other insects) include chemicals such as cyfluthrin, bifenthrin, permethrin, and tralomethrin. Anything else is likely to be less effective and sub-optimal, even if scorpions are still mentioned on its label. Next, you should also always keep the quality of the product in mind. Unfortunately, other than reading the label and making sure that it has the ingredients that you need, all else you can do is simply read reviews and articles online. This can be both annoying and time-consuming, especially when you consider that most user reviews tend to be subjective, incomplete, inaccurate, outdated, lack context, and riddled unaccounted mistakes made by the user themselves. However, reading enough such reviews, especially while mindful of their nature, can still give you a good, broad picture on whether a product is good enough and is suitable for your situation or not. Additionally, you should also take a look at industry professional reviews. These can often be a bit biased, but they tend to include more information, to be more accurate, and to be accompanied by additional tips and tricks. When looking for products of a high enough quality, it’s always recommended to also take a look at their brands. Brands aren’t the be-all and end-all of judging quality, of course. Some prominent brands are known to produce subpar products, while many unknown brands can often create and sell excellent insecticides. Nevertheless, when you are in doubt, keeping the products’ brands in mind can help you make a decision. Some of the brands we’d recommend include Raid, Hot Shot, Terro, Harris, Demand, Bayer, Cy-Kick, MGK, and others. Hand aerosol sprayers are intended for indoor use against individual insects. They are typically (not always) less toxic than other products and while direct skin contact should be avoided, they are harmless once they dry off. These sprays are handy when you’re saying random individual scorpions here and there, but they lack in both power and quantity when it comes to dealing with full-blown scorpion invasions. Additionally, while they can have some residual effect, it is not as long and as prominent as that of more heavy duty products. Highly toxic on-contact scorpion killers with strong residual effect. Usually sold in large tubes and meant to be diluted with water, these insecticides can kill scorpions almost instantly when applied on them, but they also have a strong long-lasting effect on the areas they are applied to. This makes them very versatile and useful in a lot of situations, however, their high toxicity is unpleasant for residential areas or around food processing facilities, especially if there are kids and pets running around. Strong scorpion insecticides that are intended mostly for their residual effects. These products also tend to come in large tubes, but they have a lesser on-contact effect. Consumers tend to think that if an insecticide doesn’t kill the scorpion instantly upon contact then it won’t have a strong residual effect but that’s often not true. These products are most effective exactly as preventive measures and they need to be applied and reapplied thoroughly around the premises to make sure that you won’t have to deal with scorpions again anytime soon. So, as you can see, there are quite a lot of things to consider when choosing a scorpion killer insecticide. Hopefully, this quick info dump, accompanied by extensive research will help you make the right decision. When you’re in the middle of a scorpion infestation, remember that you may have reached a point where the scorpions aren’t only coming from the outside, but are by now also coming from inside the premises. If you’ve had scorpions for a while and have been slow to deal with them, there is a significant chance that some of them might have taken residence in infrequently used cupboards, kitchen cabinets, clothing drawers, wardrobes, and other such dark and secluded locations. In that case, it won’t be enough to just threat the outside walls and windows of your home with insecticide, you’ll also have to deal with every single scorpion and scorpion egg cluster inside your home. This also means that you’ll need to be extra careful when reaching into drawers and cabinets that you don’t use on a daily basis. We don’t say this to scare you, but simply to point out that in conjunction with the application of the insecticide you should also conduct a thorough indoors cleaning of your whole living and storage space. Empty every single drawer, cabinet, and wardrobe, be extra careful while doing so not to accidentally stumble upon a scorpion, and clean everything meticulously. When the product needs to be diluted, do so in the exact quantities and ration that are mentioned on its label. Diluting an insecticide too much can make it ineffective, while not diluting it enough can make it too toxic for your home. Reapply the product frequently. This depends on the exact type of product, but most insecticides need to be reapplied a couple of times for their full effect to kick in, as well as be applied once again after their period of effectiveness expires. A common mistake a lot of homeowners make is applying their insecticide of choice once around their home and then forgetting about it. Keep the insecticide away from direct skin contact. Be very careful when handling insecticides, even if they are not all that toxic. Always use rubber gloves and a face mask, as well as a protective apron. Also, keep yourself, your kids, and your pets away from the treated areas until they dry off properly. Different insecticides can take different time to dry off completely, so be careful. Make sure you apply the insecticide in the right locations. Pouring toxic insecticide in the middle of your kitchen or living room is obviously not just a bad idea, but also bound to be ineffective. When applying a preventive insecticide with strong residual effects, start from the outside of your home and property. Apply them in the ground next to your home’s walls, as well as on the walls themselves for at least one-foot height. Make sure to cover everything carefully, and pay extra attention to the edges of windows, pipes, AC installations, drains, and other such places that scorpions can use as entrances to your home. Spray extra rigorously every crack, crevice, and nook you see on your wall. Focus on non-porous surfaces if you can. A lot of scorpion insecticides, including quite a few of the otherwise good ones, work less effectively when applied to porous surfaces. That’s because such surfaces absorb too much of the poison, as well as allow the insects to walk over them without coming in contact with the whole surface. Instead, treating non-porous surfaces drastically increases the effectiveness of the insecticide. Scorpion proof your home and property. In addition to using an insecticide, there are a lot of other things you can do for your home and property to make them safer against scorpion invaders. The first and probably most obvious thing is to seal off all or most possible entrances for the unwanted bugs. All cracks, crevices, and nooks in your walls need to be sealed off completely. All smaller openings around doors, windows, AC units, drain pipes, and other such places should either be well sealed off or stuffed with as much insecticide as they can handle. Additionally, making the yard or property around your home more scorpion un-friendly is always smart. Scorpions like to dwell in high grass or underwood, stone or debris, as this makes them safer from the sun, as well as from you. So, your next step should be to remove all bricks, trash, stones, wooden logs, boards, and other debris from around your home. After that, remember to keep your grass well mowed at all times. Also, and this should go without saying but – don’t ever leave shoes, towels or other pieces of cloth outside, and always wear shoes when you go out. Deprive scorpions of their food source. Scorpions don’t enter our homes because they like the ambiance, they do so in search for food. Scorpions are carnivorous and eat other insects, which is technically their best feature. Additionally, it also means that it’s in your best interest to remove their food source from your home anyway. 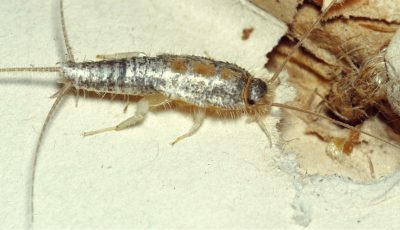 This includes cleaning your home from all insects such as cockroaches, crickets, ants, moths, fleas, and ticks so that scorpions are not incentivized to enter at all. Of course, this won’t deal with the whole problem, but it’s a good additional step to take. As you can see, a lot of the myths and rumors that insecticides don’t kill scorpions are somewhat justified – there are, after all, a lot of insecticides that don’t work well against the scorpions’ big size and through the external shell. However, there are enough strong and specialized scorpion killers that can work very well when applied correctly and that can even kill scorpions on contact. Of course, as with any other insecticide, the way you apply it, the location you treat, the type of surface you apply the product on, as well as the environment and condition under which it needs to operate all have detrimental roles in its overall effectiveness. If everything is done adequately, however, and if you have got the right insecticide, chances are that you’ll quickly and effectively deal with your scorpion problem. So, to wrap things up, here are once again the Top 3 insecticides we’d recommend if you have a scorpion problem. One is a highly toxic insecticide for mass application, another one is a hand aerosol spray for dealing with individual bugs, and the last one is a strong product focused mostly on its residual effect and overall scorpion prevention. The Cy-Kick Scorpions Pest Control Insecticide is considered by many to be the best poison for scorpions in terms of sheer power and effectiveness. Its active ingredient is Cyfluthrin 6.0% which makes it highly toxic in its liquid form. It can be used indoors as well as outdoors, provided that you are careful enough but it’s generally advisable not to pour it in a spray bottle and use it as a scorpion spray as this will risk needless skin contact. Intended for heavy scorpion infestation problems, this scorpion insecticide is ideal for people with yards and outdoor properties that need to be extensively purged from scorpion, centipede, spider or other insect presence. The Terro Scorpion Killer Spray is a great household spray product for dealing with pesky scorpions, spiders, ticks, fleas, ants, cockroaches or other similar insect pests. When applied directly in a large enough quantity it can easily kill or contact. Additionally, it can also have a residual effect of up to 6 weeks under the right conditions, which mostly means – indoors. As a spray product, this Terro scorpion killer is not something you’d use for mass exterminations, but it is a great and handy tool for dealing with individual pests. The Onslaught FastCap Spider and Scorpion Insecticide utilize Esfenvalerate 6.40%, Prallethrin 1.60%, and Piperonyl butoxide 8.00% as its active ingredients. This gives it a great and long-lasting residual potential and makes it a highly effective insecticide for both stopping insect infestations and preventing their further spread. 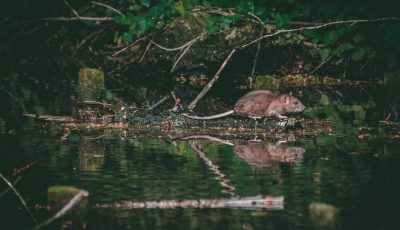 In its wet form it is harmful when it comes in direct contact with human or mammal skin, but once it has dried off it is safe for use even in residential areas and food-processing facilities.